Update your files. Archive or discard old documents and set up the folders you will need in 2012. Review your contact database to ensure the information is up to date, and add people you have missed to your social networks. Set the course for your staff. Even if your organization doesn’t conduct year-end evaluations, schedule time to talk with every team member. Be sure that they understand what they must do to succeed in the year ahead. Review your organization, team and individual goals. Map out your year. Fill in your calendar before others take over your time. Set times to work on your goals, coach your staff and take your vacations. Do that now and you won’t fall into the trap of being “too busy” later. Revive relationships. Don’t carry conflict over into the new year. If you have had difficulty with a co-worker, invite the person to coffee and clear the air. Example: “I feel like we have been competing for the past several months, and I’d like for us to work together going forward.” Admit your part in the situation and commit to change. When you walk in the office on Jan. 2, you will be ready to move forward. No one who responded to our poll last month is worried about recruiting new team members in 2012, but 43% said your top priority will be training or coaching your team members. The other poll answers were split evenly among innovating, keeping the budget in check, developing your own skills and improving time management. Find a full range of resources for training your team and honing your skills in the Workplace Training Center. Bonus: You’ll receive a $20 Visa Gift Card with every purchase you make during December, so hurry! 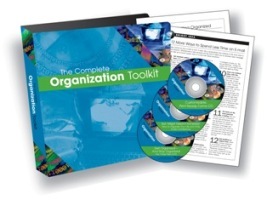 The Complete Organization Toolkit teaches you and your staff how to organize your workplace and workloads so that you maximize those hours you spend in the office. In an easy-to-understand, step-by-step process, you’ll gain tips for organizing every aspect of your work life. But best of all, the product provides you with a detailed process and all the handouts you need to conduct a successful, thorough and memorable training session. This budget-friendly product is designed to save you the time of developing your own training session—and it teaches you and your employees how to develop an effective and efficient organizational system. The 22-minute instructional video Get Organized and Stay Organized: The 7-Day Plan for Putting Your Work Life in Order. The 60-minute tip-filled audio program But I Might Need It Someday! How to Organize Your Life and Time. This two-day workshop will help you achieve your goals through powerful communication. You’ll leave more confident and more persuasive! Jan. 26-27: San Diego, Calif.
Jan. 30-31: Hilton Head, S.C. This entry was posted in Communication Briefings E-Letter and tagged goals, New Year's resolutions, Organization, Time management, training. Bookmark the permalink.